I actually don’t know if Harajuku is for lovers. I think i’m a bit confused, I think its ‘’Harajuku lovers’’ like Gwen Stefani sang in some song. 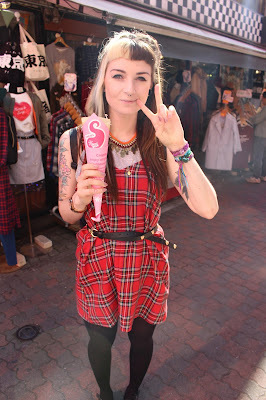 I do know Harajuku is for shopping, eating all the crepes and taking in all the weird and wonderful fashion. Be careful not to gwape. There are a lot of Fashion ‘’meccas’’ London, Paris and Milan mine is Tokyo. The Street fashion is what got me initially hooked on this gorgeous weirdly wonderful island, the Harajuku girls to be exact, this is where it all started, this is where the obsession began and to see it in real life was a dream come true. Come with me, let me introduce you to a little place I left my heart and destroyed my bank account. Takeshita street [Yup, my inner 5 year old comes out and I laugh so hard whenever I see the street name, i’m super lame] It is the best place to find all kawaii treasures ever made ever, conveniently all in one stop. Now we made the mistake of going to Harajuku on Sunday, it was super busy and super rammed but I intentionally went on that day to see if I could spy some Harajuku girls on the bridge next to the station. Sadly there was only one couple out when we got there, usually the bridge is brimming with weirdly wonderful cosplayers showing off how amazing the Harajuku culture is. The couple I managed to snap gave just a snippet of how creative they can get. Like literally the creativity makes me want to cry I love it so much. Tad overdramatic Jess. I’d say Harajuku and partially this street battered my bank account the most, I could of quite happily spent majority of my spending money here [ Honestly I probably did] picking up some pretty wicked souvenirs and getting my hands on some awesome kawaii grunge pieces. I wish I was able to take more photos of the stalls and stores, but it was strictly a no go down the street, i’ll have to save what I got for a Harajuku haul video. Harajuku has such a Camden vibe to it with a Tokyo. Its colourful its loud its fun. It’s organised chaos. It’s kawaii heaven. The street art and graffiti tie in so well, with something new to see or be discovered. In a nutshell its pretty much whats going on in my head, it’s my meant-to-be home. Its where I want to be right now instead of sat on my sofa on this dreary Friday night.